Rock Climbing is a thrilling extreme sport that has exploded in popularity recently, and considering the many benefits of this adrenaline-pumping experience, its not hard to see why. Not only does it get you out and about, but is is hugely beneficial for both your body and your mind, and the combination of difficulty, fear and exercise make this sport immensely rewarding, as well as utterly thrilling - you will be buzzing for the rest of the day! This fantastic one-day course will introduce a total novice to the thrilling world of outdoor climbing. 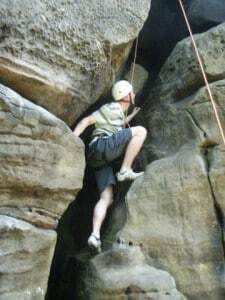 Climbing at at one of the Sandstone crags in Sussex is a fantastic experience and very rewarding, as it boasts a very soft, sandy rock which makes for some interesting, varied and enjoyable climbing! Great fun for all - see how far you come!Once you have arrived and been welcomed to the centre your day will begin with a thorough safety briefing covering all aspects of the equipment and the surroundings. Once briefed you’ll be ready to get started, beginning with some basic skill learning, you will be practising the climbing techniques and etiquette and the all important equipment selection. Then once the basics have been learnt you will be able to practice and perfect with expert tuition providing constant guidance. This superb introduction to this popular sport will give you a solid base of understanding, from which you can take Rock Climbing as far and as high as you like! This course is available roughly once every two months from March to October. NB: This is a new age restriction, so any under 18s with previously bought vouchers will still be honoured provided they are accompanied by a participating parent or legal guardian. This is a full day course lasting 6 - 7 hours. Participants: The Rock Climbing Introductory Experience Sussex is for 1 participant. There will be a maximum of 8 climbers per instructor, and spectators are more than welcome to come and watch your rock climbing adventure! All specialist equipment with be provided by the centre. You should wear trainers and un-restrictive clothing that is suitable for the weather conditions. Please bring a packed lunch and plenty of water as there are normally no shops near the crags. Rock climbing courses will not be affected by extreme weather conditions. Although cancelled on my first date choice, this turned out to be a great day despite being on a damp October Sunday. The instructor was excellent with good personable and technical skills. Everyone attending was very friendly and helped each other with motivation and support. I would have liked smaller groups so we could climb a little more but by the end of the day we were physically tired. You need a good level of overall fitness to go for the whole day. Also, there weren't enough larger sized climbing shoes so had to share. Strangely they had plenty of size 8s and under but not many above. Ended up sharing but this didn't spoil the day. Other equipment was perfectly good. Can't imagine doing this experience in the pouring rain so grateful the weather kept dry after an overnight soaking. Overall very pleased I took on this challenge.. enjoyed very much. Instructor Chris gave me courage, confidence and the techniques required tackle the obstacles in front of me..so much so I have fallen in love with the sport. This was a great introduction to rock climbing. Tom was first class; he empowered us with his expertise & knowledge. It was clear Tom has a real passion and love of the sport. I came away with the knowledge and confidence that I can progress to the next level. I will definitely be signing up to another of Tom's courses in the near future. Thanks for a great day. the instructor's were both fantastically friendly and knowledgeable and it was a positive first experience of climbing on sandstone. We recently caught up with Tom from Hatt Adventures to learn more about the Sussex-based adventure company as a whole…having spoken with them, we then felt compelled to dive a little deeper, and find out more about some of the awesome people who work there. Senior climbing instructor Kyle Holman kindly shared his personal experiences with us…check it out – we think he’s a hell of a guy! How and when did you first get into Rock climbing? My first introduction to rock climbing was in against the incredible scenery of Glen Nevis, at the foot of Ben Nevis in Scotland. Glen Nevis hosts hundreds of small granite rock outcrops (Polldubh) and is easily accessible from the roadside, probably what my father had in mind when he took a grumbling eleven year old out. I was led to Pinnacle Butress, to climb Pinnacle ridge (grade: very difficult) – a great beginners route with lots of holds, fantastic rock, and great exposure to the elements. Now, as a guide, I’ll never forget the importance of being clear with my instructions; as when my father called down to an eleven year old me to “swing around the corner”, I took this rather literally took hold of the rope with both hands, leapt out and swung round! I must have climbed it a dozen times since, as have thousands since me, as the rock is polished – but it’s still great. Great scenic locations, a manageable challenge and an adventurous experience got me started that day. Soon after I was zip-wiring into quarries (another story for another time). Wow – sounds like you’ve lead a pretty adventurous life so far! How long have you worked at Hatt Adventures for, and what did you do as a living before your current position? I have worked for Hatt adventures since 2007 as a part-time member of staff, balancing my adventures work alongside my job as an Apprenticeships tutor at a Brighton college. In past lives I worked in various outdoor centres and colleges teaching and running environmental science courses, youth work programmes, and guiding clients. So you know your stuff then! What’s the biggest perk of your job? I love the outdoors, so meeting enthusiastic people who want to take up a new hobby, learn skills and find an adventure is great. I never bore of seeing clients become empowered and having a great staff team means that we ourselves are continually off on our own adventures. And what makes the rock climbing experiences with Hatt Adventures so great? What sets you guys apart from similar experiences within your field? 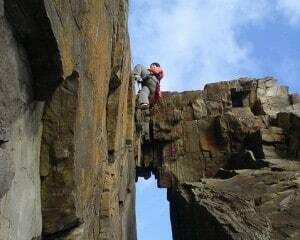 Our rock climbing trips are open to all, everyone can be challenged. We like to empower new climbers so they can confidently make decisions – whether they want to learn skills or have a great experience, the customer always has a say. Our Hatt Adventures staff are knowledgeable, qualified and recognise that tailoring programmes to clients is key to ensuring all clients get out of the day, what they intended. What can customers expect from an Introductory Rock Climbing session with you? Organisation, lots of climbing, Q&A, local history and geology, an opportunity to learn skills and techniques, empowerment to become an independent climber and an enjoyable day out! What’s your most frequently asked question from customers…and of course, could you share the answer? “Is it dangerous?” – A huge question, often asked at the beginning of the day. My answer is “No” – not if you exercise considered judgement. Health and Safety is often cited as an excuse these days and a lot of people are no longer allowed or used to learning new skills and making judgements on their own. Fortunately that’s what we are for – to help you to make those judgements and recognise and manage risks. And finally…have you got any funny rock climbing anecdotes you could share with our readers? 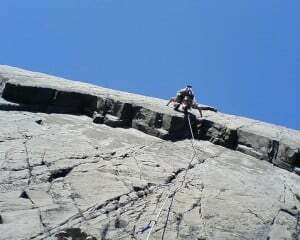 Everyone at some point pulls off a piece of rock or knocks a pebble when climbing. I once knocked a refrigerator-sized block off and into the sea whilst on Lundy. Tom Hatt (Company Founder) thought the enormous booming splash was me! Slightly over-enthusiastically climbing in Wales in the winter – a 90m route which was supposed to take an hour – it took us 6 hours to climb with one head torch and no ice axes between us. We were very much be-knighted. It is often said that walking to and from a crag is the dangerous part of climbing trips. My partner, on a Peak District trip, was carrying the heavy bag and tripped, falling over and landing on his back – head first down a small slope, in stinging nettles…he was wearing shorts and t-shirt! Apart from the amusement this caused, the same person then fell off his route and had to be lowered off…again into the same stinging nettles (groan). I got to the top though and it was a fantastic route! Thank you ever so much for sharing your knowledge and stories with us Kyle! If you fancy having a go at rock climbing, then Kyle is your guy – check out our Rock Climbing Introductory Experience, with Hatt Adventures! At what height can you climb up to on the Rock Climbing Introductory Experience Sussex? 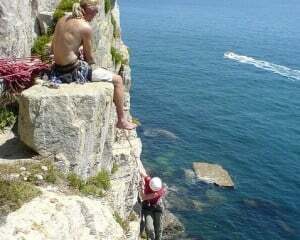 You could end up climbing up to 30 - 40ft when taking the Rock Climbing Introductory Experience Sussex. This all depends on how you progress throughout the experience.